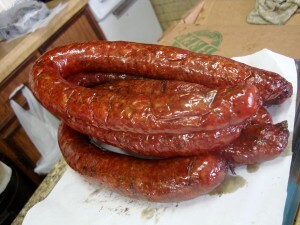 Unbelievably good sausage is coming out of the tiny smokehouse, Perez Barbecue up in Bartlett, Texas. It’s a different style than what I’m accustomed to with sage being the predominant (and delicious) flavor. In business for a quarter century, the roadside stand is certainly humble but the quality of the smoked meat and good, small-town hospitality make this barbecue restaurant more than worth the hour or so it will take you to get there from Austin proper. Please be aware that Perez Barbecue is only open on Saturday and Sunday and like all of my favorite meat houses, when they sell out of their day’s supply they pack it in and head to the house. This entry was posted in Rural Texas, Texas Barbecue, Texas Daily Photo and tagged barbecue, BBQ, best barbecue, Brisket, central Texas hot guts, perez barbecue, rural Texas, texas, Texas Daily Photo. Bookmark the permalink.